JPNIC issues triannual newsletters covering various topics concerning JPNIC activities and the Internet Industry to deliver our news to JPNIC Members and other stakeholders in the industry. Since its Issue 57 in August 2014, we provide the summary in English. "Special Article 1" covers recent developments on Internet Governance, focusing on IANA Stewardship transition. Since September 2014, the communities on three IANA resources, IETF for protocol parameters, ICANN for domain names and RIRs for IP numbers had been discussing their proposals on respective resources until January 15, 2015. 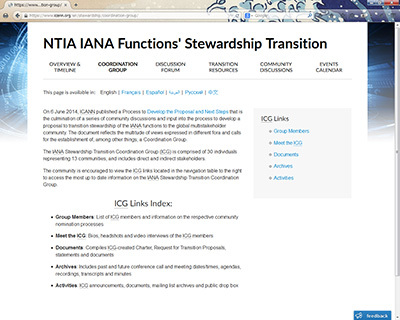 This article overviews three proposals and identifies the key points for the development of integrated proposal by ICG - IANA Stewardship Coordination Group. "Special Article 2" of issue 59 reports "Internet Week 2014" which is held annually by JPNIC in late November, and its plenary program "IP Meeting 2014". "Rethinking 'our' Internet" was the theme of Internet Week 2014. With it also applied to its plenary, IP Meeting 2014 successfully draw audience's attention with two interesting panel discussion sessions which are "Internet Governance from business point of view" and "Future infrastructure to be constructed by 'us' all - Three years after the disaster, toward Tokyo 2020 Olympic Paralympic Games". This articles mainly covers these sessions. "A Scene on the Internet History" is titled "Emergence and Deployment of Internetworking - with focus on the achievement of Professor Eisuke HAYASHI", to overview how the Internet was emerged among academic networks and then deployed toward municipalities and schools. "Introducing JPNIC Member" which focuses on a JPNIC member with interesting activities in every issue this time introduces Kyushu Telecommunication Network Co., Inc. (QTnet). QTnet is a telecom operator serving Kyushu area mainly with FTTH, and sponsored APRICOT-APAN 2015 which was held in Fukuoka from late February to early March. QTnet, as a company rooted in the region, put a considerable contribution for network infrastructure of the conference as well as valuable suggestions for APRICOT-APAN 2015. "Internet terms in ten minutes" picks up "SSL/TLS" which recently gathers a lot of attention for vulnerabilities associated with them. Issue 59 further covers APRICOT-APAN2015, JPNIC General Meeting in December 2014, ICANN 51 Meeting, APNIC 38 Conference and IETF 91 meetings with detailed reports and statistics published by JPNIC. We do hope these articles are useful for a lot of readers. If you have any questions or feedback, please feel free to contact us at jpnic-news@nic.ad.jp. Your input is always highly appreciated.